On a sweltering day in London, fifteen students and alumni from LUCA clubs lined up for the 38th London Marathon. One of these runners was Rob Pope, a former student of the Royal Veterinary College. Pope ran this year’s London Marathon dressed as Tom Hanks’ Oscar-winning character, Forest Gump, in 2 hours, 36 minutes and 28 seconds. His achievement earned him a Guinness World Record for the fastest male marathon runner in a film character costume. This wasn’t the first time Pope has run dressed as Gump, as we’ve previously reported here. 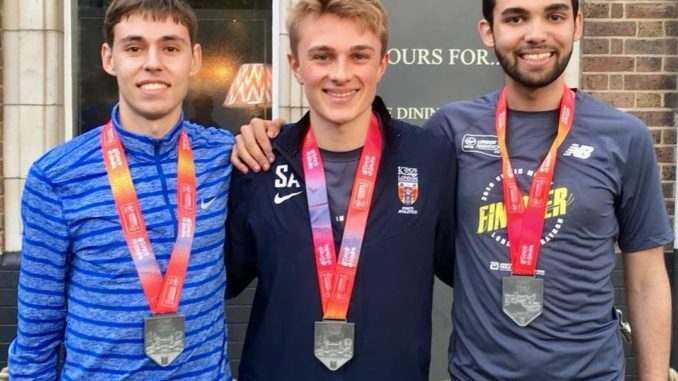 There was also good news for UCL alumni and Oxford student Rahil Sachak-Patwa who finished 2 hours 41 minutes and 43 seconds and helped the Oxford team to varsity victory. Sachak-Patwa ran the Marathon last year in 4:17:00, documenting his experience of hitting the wall here. The first LUCA student across the line was Jonathan Baird of Imperial (2:58:24) followed closely behind by Ross McGhie of King’s in 02:58:55. The BBC cameras caught third place Fergus Johnson (Imperial) complete the race in 3:09:13. Sam Appleton of King’s came in at 3:14:38. Anna Lawson of Imperial pulled of an impressive 3:17:21, a big PB over her 3:28.51 set in Dublin two years ago. Lucy Spencer of King’s was the second LUCA woman across the line in 3:30.13 followed by Megan Wilson of UCL in 3:35.13. Despite a trip and severe cramps, King’s student Jamie Dellimore finished his marathon debut in a more than respectable 3:28.44. He finished ahead of King’s distance coach and Croydon Harriers athlete, Neil Aikman (3:38.49). Queen Mary PhD student Richard Sun, who ran the Boston Marathon last weekend completed his 10th road marathon in 3:48.09. Sun had to quickly adapt from running one of the wettest and coldest Boston marathons to running the hottest London marathon on record. Sun is targeting completing all the world major marathons. 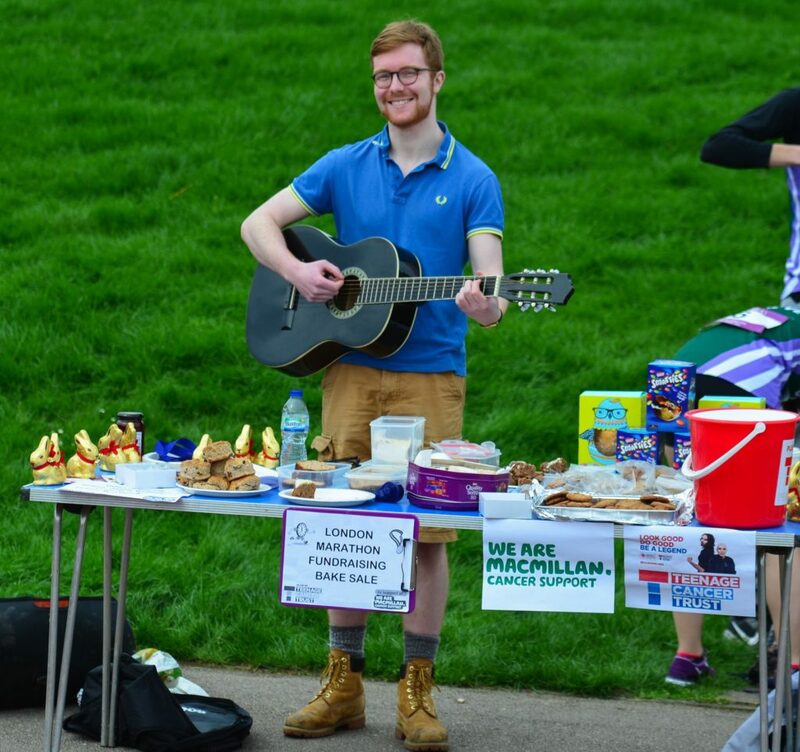 There were also strong runs from Douglas Morgan of King’s (better known for bake-sales and busking at LUCA Outdoors) and Madeleine Whybrow of Imperial (4:10.46). UCL’s Emma Kerr, who came third in the LUCA 10,000 championship finished the marathon in 4:43.03. King’s student Borgan Venovski battled through injury and despite being advised to stop, battled his way to the end and finished in 6:07:25. The high temperatures, coming after a long winter of historic lows, makes the achievement of all these runners even greater. Balancing studies alongside training for a marathon is not easy and all those who completed it deserve our highest admiration. *email james.findon@kcl.ac.uk to add people to this list.